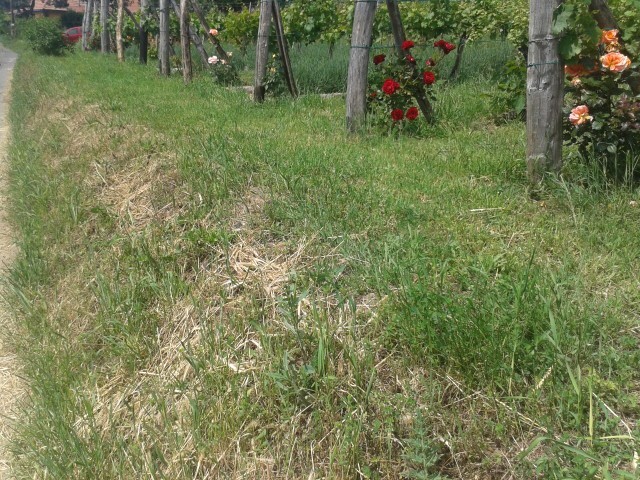 In some vineyards, you may see rose bushes at the end of the vine rows. Vineyard end post rose bush. The historical reason for this was for fungus control. You see, both wine vines and rose bushes are susceptible to the same fungal mildew diseases (such as downy and powdery mildew). The idea was that if there was a strong fungus pressure then the roses would first show symptoms and the vineyard owner would know it was time to spray some anti-fungal treatment on the vines. Spraying costs time and money, so the idea was not to spray unless one needed to. Regular spray routines are standard practice in many current vineyard management plans, and there are more established methods to determine spray schedules. And highly susceptible rose bush varieties may actually increase fungal disease pressure. So roses in the vineyard these days are mainly for tradition and show. After all, they are pretty and look good at the end of the vine rows. And unlike the above photo, most rose buses are normally planted on the outside of the last vine row post. The above photo is from one of our vineyards and there is a good reason why the rose bushes are planted on the inside of the rows: there is a steep drop off nearby and rose buses planted on the outside of the post would not allow a tractor to drive by. Vineyard end posts near hill edge.